Pyramids are powerful crystals that are a lot like the crystal balls, but have a unique way of healing our spirit and entering the 7 chakras of our body, thus filling our body with positive energetic rays and getting rid of the negative ones. Pyramids not only heal one person, but can do multiple individuals at one time, which is why it is recommended to be placed in the center of a house as a focal point from where it can have apprehensive approach to every residing person in the area. 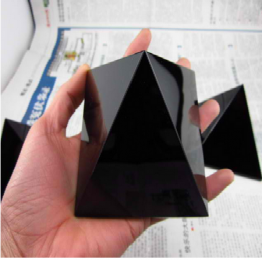 Pyramids have a special property to deflect any type of cosmic radiations that fall on its apex downwards through its base line at the bottom where this deflected cosmic radiation, with the help of magnetic field of Earth’s gravitational force, create a new and powerful bio-energy field, so be assured that with this Black Healing Pyramid, you will be like a brand new person.